The following short case studies will present and discuss readily available information on deficits in the planning, programming implementation and control of military expenditures in the East- African countries of Ethiopia, Burundi, Kenya, Tanzania and Uganda. The case studies are structured as follows: first, general information on the military sector, especially size and meaning of the armed forces and military expenditures, is presented. Second, to the extent that information could be found, brief accounts are given of the treatment of military expenditures in the budgeting process, of the official reports on military expenditures, of problems with the official data, of the implementation of the budgets and auditing. The assessments include the full budget cycle, from planning and programming, via reporting and implementation, to control and auditing of the budget. 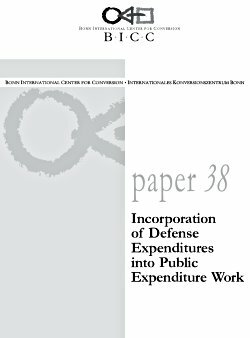 The case studies conclude with a subjective assessment of the size and importance of deficits in military expenditure budgeting, including issues of transparency, and deficits in the decisionmaking process on and control of military expenditures. The study concludes with a short comparison of the results for the five countries and a summary of the needs for further research. Furthermore, opportunities for German development assistance to strengthen incorporation of military expenditures into PEM in the five countries are outlined. Tables on military expenditure figures from different sources, as well as data on arms imports and armed forces can be found in the annex.